travel | "Pancakes and Mash"
Details of transport to, from, and around the city of Lincoln. Lincoln is a small, compact city and it’s only a short walk from the Brayford Waterfront (where the University campus is located) to the High Street and the historic uphill Cathedral Quarter. 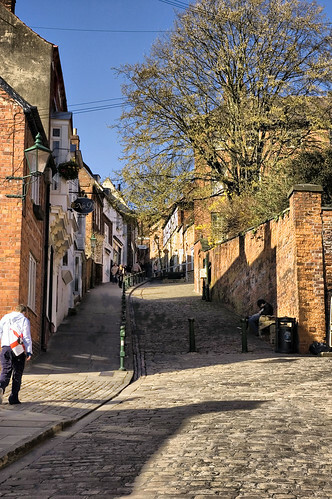 However there is a ‘Walk & Ride‘ shuttlebus between downhill and uphill Lincoln, if you don’t fancy tackling Steep Hill. There are connections to Lincoln Central from the East Coast Main Line at Peterborough, Newark, Retford and Doncaster. Come out of the railway station and turn left along St Mary’s Street. Go to the end of the street, to the church of St Mary-le-Wigford, by the traffic lights. Go along the path to the right of the British Heart Foundation charity shop, up Wigford Way. Turn left onto Brayford Street and walk past the entrance to the NCP car park. At the end of this road turn left on to Brayford Wharf East, and cross the road toward the lake (Brayford Pool). Turn right before the level crossing and follow the footpath on to the campus. Walk straight through the Main Admin Building and out the other side. EMMTEC will be in front of you, to your right. Unfortunately there is no parking available on campus, but there are a number of public car parks nearby, including discounted parking for visitors to the University at the NCP ‘High Street’ multi-storey car park on Brayford Street (LN5 7BJ). To receive a discount in this car park, you will need to take your ticket to a validation machine in the Engine Shed (Tower Bar) on campus before you return to your car.